Take Shelter is an original story woven around the desperation of middle-class, middle-Americans following the economic slowdown of recent years. Michael Shannon’s strong acting skills are brought to bear in this slow-building, gripping drama-thriller directed by Jeff Nichols. One or two scenes may stop you from considering this film outstanding but it is nevertheless a very good all-round production which should be seen by all serious movie-goers. You can find more information on this U.S. movie on Wikipedia and IMDb. Oh my gosh YES. I loved this film so much. It’s really close to the top of my “best films you probably haven’t seen” list. Love this movie. One of my favorites from 2011, and a phenomenal performance from Michael Shannon. 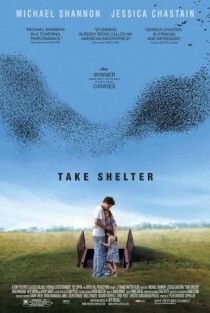 Love this movie, and the scene in the shelter, when he can’t open the door – classic. What a great film! A horror film that creeps you out so much because what happens to Michael Shannon’s character could happen to everyone! That’s real horror! One the best movies I seen in a long time. We need a little bit more of this from time to time.